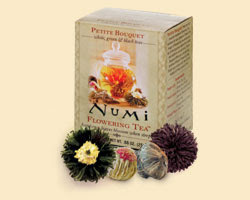 I think Numi flowering teas are so much fun I want to give some away. So I am! Four of them, to be precise. Check out the Numi website - you can see the teas in all their blooming splendor. One will be given away by Contest Machine, for those who want an easy entry. Doesn't everyone want an easy entry? Sure you do! The other three will be given away to people who also leave a comment, Subscribe, follow on blogger, follow on twitter, tweet, talk about it on facebook, email a gaggle of friends and copy me, or post about it wherever else tens of people could see it. For each one of those things you do, please come back here and leave me another comment saying you did and pointing me to it, if possible. Also, if you have entered one of my contests before, you can take another entry. If you want to send constructive criticism (about my blog, not my person - I'm in no way ready to get into that kind of change) you can send it to me in a DM on twitter, and give yourself an extra entry for that as well. *This giveaway is not sponsored by Numi. To enter the other giveaways going on this week check out Bloggy Carnival! These are the coolest tea sets.. I have been dying to try one. Those teas are so pretty, I hope they taste as good. Amazing...this is a new one on me...as a DIY'er I would LOVE TO grow my own teas and beautiful ones at that!! I love the argyle borders on this blog btw! will this count as my easy entry? I know several of my facebook friends like me are tea drinkers so I changed my status :) Hope this brings in more traffic to your blog. I think I'm confused about how to enter the contest - via the form or via a comment, but I'm taking a chance and just leaving a comment. I'm NOT confused about Numi tea though. I've never had the flowering kind, but the lime tea is lovely! I entered the form and wasn't sure if I should post a comment. I would love a chance to try out there products. i have really been wanting to try these! thakns for the chance! What an amazing product!! That is like a work of art! I bet the tea is amazing! I haven't had a chance to try them yet, but I'm a tea-lover :) The Numi flowering teas are so pretty. *Thanks* for the giveaway! I have heard of these before but never tried it. One of the coolest things I have seen in a long time. I'd love to win this. I sent for a sample over a month ago but never got it. It looks great. The flowering teas are awesome. I couldn't stop watching the clip on the Numi website.Thanks for the giveaway! I have never heard of this! Please enter me! I'm following on Twitter~Groomer Angie. That would be entry number 3? WOW!! The video of the tea opening, flowering, and steeping was astounding! My family would go wild for that! Thank you for this clever giveaway. I'm a real tea junkie and I've always wanted to try these teas! I am new here but I subscribed and I am following velvet1116, thanks for the teas ,I have always wanted to try. HEY I'm sooo excited They have lemongrass teas! My favorite, and I can never find it!